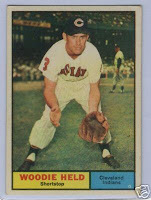 Woodie Held passed away earlier today (Thursday) at age 77. He held the record for the most homers by a Tribe Shortstop until Peralta broke his record this season. Held played for the Indians from 1958-1964 and racked up 85 home runs. He also played for the Royals, Angels, Yankees, Orioles, White Sox and Washington Senators, and was a perennial part of the Indians Fantasy Camp (which I hope to be blessed with attending some day). He had been battling a long fight with cancer until his death. He will be a very missed part of the Indians family.